I was on my way to Las Vegas where my daughter was playing in a volleyball tournament over the week. She and my wife would be flying in Friday evening, but I not only despise flying thanks to Homeland Security, I hate to pass up an opportunity to do some hiking and climbing on any excuse. And so I was barreling down Interstate 15 out of Barstow around midnight when I made an abrupt detour at Baker to drive about 20mi south on Kelbaker Rd in to the heart of the Mojave National Preserve. I found a dirt powerline road I was looking for and drove perhaps a half mile down this before finding a place to crash for the rest of the night. I was in the area to tackle the mighty summits of the Marl Mountains, a tiny range of dubious status ("Hills" would have been more appropriate) that need a bit of help to even identify specific summits. The range is located on the sloping west flank of Cima Dome (itself a difficult to identify summit), making it such that the highpoint at the northeast end has hardly any prominence. There are two points not far from each other vying for the honor (Evan Rasmussen misidentified the higher one some years earlier on his CA Range Highpoint tour), neither rising even 200ft from the surroundings. The only summit with more than 300ft of prominence in the range is found closer to Kelbaker Rd on the west side of the range and that's pretty much it. The morning would be spent tagging these three summit before heading to more fertile grounds. The hardest part was the struggle to get the van 4mi up the powerline road. Things worked okay while the road was straight and relatively flat, but it became a dismal trial as it wound through some low hills with rough rock, steep sections and eventually a small washout I didn't feel safe driving over. Even from where I parked however, the roundtrip to the two highpoints was only 3mi. I spent about 25min to reach the lower of the two, Marl BM (nice benchmark from 1935), where I found a Mark Adrian register from 1995. The other names I recognized ( Carey/Hanna & Terry Flood) were also from the San Diego area. 1/3mi to the NE was the range highpoint where I headed next, first dropping to a wash between the two summits before climbing easy slopes to the slightly higher point. This, too, held a register with quite a few more visitors. Smatko had left a first loose piece of paper in 1993. Adrian improved this with a stapled set of pages in 1995 and Gordon provided one constructed of stapled computer paper in 2000 - perhaps he'd run out of his Mead notebooks torn in half. The views, to no great surprise, were rather mundane. I descended north off the summit, picking up an old mining road that returned me to the powerline road which I then hiked back to the van. I was more than a little relieved to extract the poor thing from the road hazards I'd risked to get there. Back on Kelbaker Rd, I drove about a mile south before pulling over for the only real summit in this range. I was just over a mile from the summit to the east and the hike proved only slightly more effort than climbing either of the earlier two summits. Most interesting was an old register dating to 1969 from a group of climbers from the Antelope Valley YMCA hiking club. The only other entry was by a couple from Hartford, Connecticut. I marked off a small corner of the same page to add my own tiny entry 44yrs after the last one before heading back to the car. More driving. I headed south to the Kelso Depot Vistor Center where I turned left onto Kelso Cima Rd to drive northeast to Nipton. Kelso, Cima, Ivanpah and Nipton were all stops along the Union Pacific RR line back in the days of steam engines and the need to refill water stores. With the introduction of deisel engines, their usefulness evaporated. 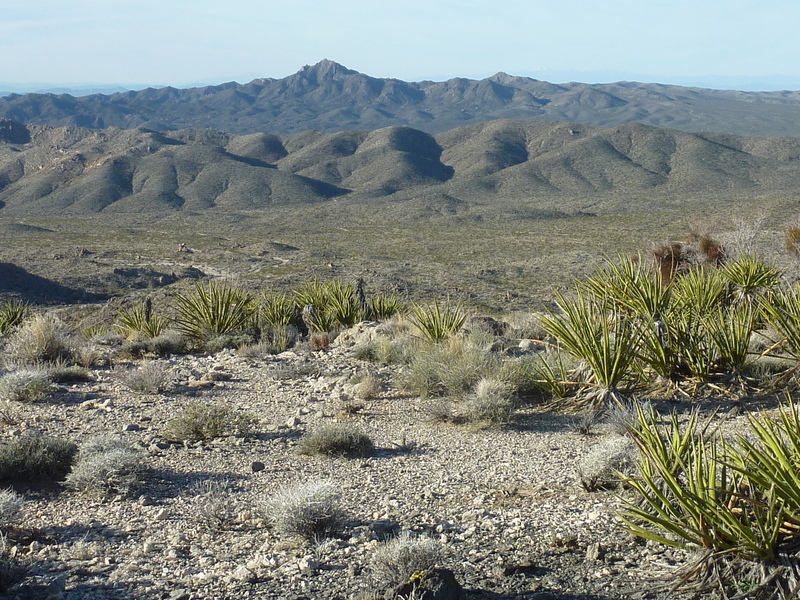 Kelso survives thanks to the National Park Service as the official Vistor Center for the Mojave National Preserve. Cima and Ivanpah lay in ruin and Nipton barely survives as a tourest stop and a small community of six. It's currently up for sale for $5M. I blew through Nipton without taking a picture (it's a quirky little town worthy of a stop for those that enjoy cultural curiosities), heading east towards Searchlight. I paused where the road enters the New York Mtns just inside the NV border in order to climb Crescent Peak, the highest summit in the Nevada portion of the range. A P1K that also appears in Zdon's guide, I had multiple reasons to pay it a visit. A good dirt road misspelled as "Creascent Peak Road" at the junction leads to within a mile of the summit on the SW side. The road continues even closer, but is signed as Private Property and leads to a small mine site that looks to be someone's man-cave playground. He was actively driving various pieces of equipment around the property while I was hiking the peak. I took about 45min to hike the SW Ridge to the summit. It was not a particularly pleasant hike because of the great abundance of spikey cactus laying in wait underfoot. Constant vigilance was required to keep from stepping on one or another, detracting from what would otherwise be enjoyable views. Once at the top, the 6,000-foot summit offers far-reaching desert views across three states (CA/NV/AZ). 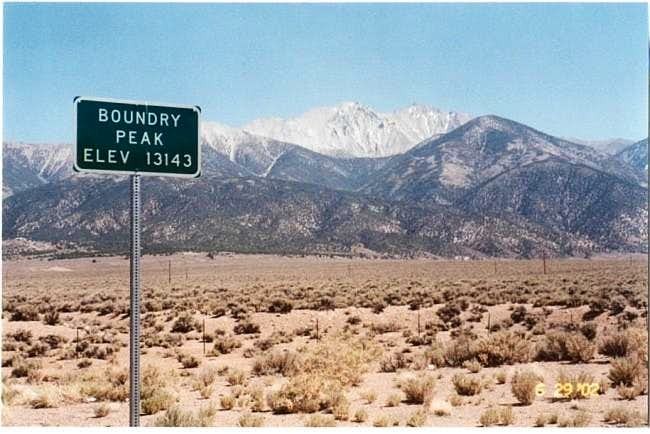 A 1925 benchmark proved the old survey crew better spellers than the Nevada DOT (I recall another sign, "Boundry Peak" the same organization had installed along US6 before it was subsequently corrected). The register was a busy one, totaling some 23 pages in all since Mark Adrian had left it in 1999. I recognized only a few of the names, including Bob Sumner, John Fedak and Chuck Ramm. The return was a slight improvement that featured fewer of the prickly obstacles. Back at the pavement I continued east to the town of Searchlight. It seemed a bit early to call it a day, so I took to tagging a few of the local hills surrounding the small crossroads community at the junction of SR164 and US95. The easiest of these is Duplex Hill on the southwest side of the junction, a hike taking only five minutes from US95 to the east. Located at the opposite corner, Doherty Mtn has an antenna installation at its summit and a road leading to it. The pavement ends after a particularly steep section past the last house found on the south slopes of the mountain. The road beyond here is too rough for low-clearance vehicles. I parked the van at the end of the paved portion and was immediately surrounded by a pack of three dogs that had come up hastily to investigate my intrusion. They belonged to that last house I had just passed but the owner did not come out to recall them or otherwise ask what the hell I was doing there. I almost decided to abandon the effort when I screwed up the courage to firmly shoo the dogs away. They didn't exactly leave but they seemed content to let me climb the peak, choosing to lie down in the shade of the van to await my return. I hiked to the summit in less than 10min and then came back to reanimate the dogs and their incessant barking. Only reluctantly did they let me reenter my vehicle after which I think I'd have happily run them over if they hadn't moved out of the roadway. The third summit I visited was named Morning Glory Mtn by Courtney Purcell in his guidebook, Rambles & Scrambles. Located a mile north of Doherty Mtn, the summit is a half mile east and 500ft above US95. A turnout due west of the peak provides convenient parking off the highway. One needs to cross a barbed-wire fence designed to keep large mammals off the roadway, after which it is a straightforward 20 minutes to reach the summit with surprisingly nice views over the southernmost part of Nevada. It was 4p by the time I returned to highway. I tried to reach one more named summit - Fourth of July Mtn about 3mi east of town. I found a good dirt road heading south off paved Cottonwood Cove Rd but it quickly became a Private Property issue. I couldn't figure out what was BLM lands around here and had done no research. My heart wasn't really in it so I quickly gave up the idea. Instead I used the lonely stretch of road to take a shower before heading back to Searchlight. I grabbed a salad to go from the McDonalds and headed north on US95 for the Ireteba Peaks where I planned to hike the next morning. I managed to drive the van about 3mi east of the highway on a sandy, uneven road to the base of the mountains where I found a very quiet spot to spend the night - one of the better desert campsites I had on this roadtrip, actually.